Moroccan Spahi by Lucien Rousselot, circa 1950, Musée des Spahi, Senlis, France. 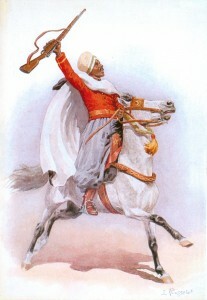 This Spahi takes part in a fantasia, the festive show of a large group of North African horsemen to show their bravoure. He has just fired his rifle simultaneously with all other horsemen and runs away at maximum speed standing in his stirrups. He has the reins in his left hand, but at the moment of the shot he has both hands on the rifle while the reins hang over his left shoulder. For each participant the fantasia is a symbol of heroism. The muslim faith is at the basis of the fantasia. See Sedratti, Tavernier, Wallet, L’art de la fantasia. Paris 1997.